Home » Economy Graphs » Do Millennials Have It Better or Worse Than Generations Past? 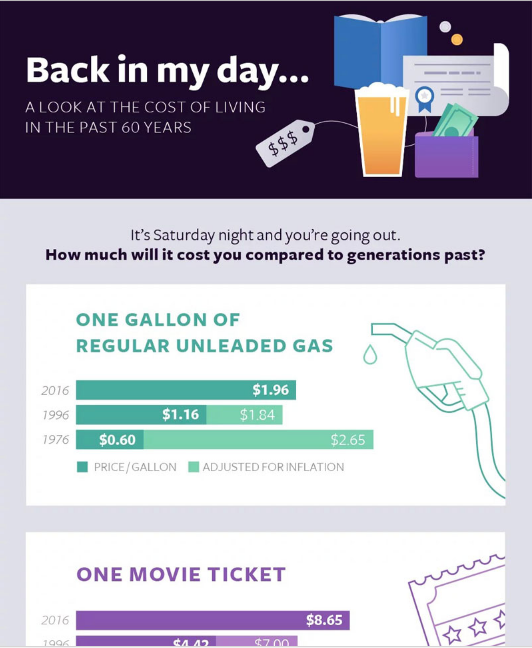 In an effort to understand what millennials are dealing with, we decided to evaluate the cost of living for generations past. From the silent generation to the newly minted Generation Z, here’s Student Loan Hero's study on how the cost of living has changed over the past few decades. Rent: Millennials pay the highest rents when entering the workforce, with a 2017 average of $1,358. By comparison, Gen-Xers paid just $850 (in today’s dollars) in rent per month at the same life stage, and the Silent Generation paid under $500. Homeownership: Millennials buying their first homes today will pay 39% more than baby boomers taking the same step in the 1980s. Education: When millennials were born, tuition at public 4-year colleges was just $3,190 per year (adjusted for inflation). By the time they grew up and enrolled in college, tuition rose 213% to today’s cost of $9,970 per year. Wages: Millennials and other generations have benefitted from a 67% rise in wages since 1970. However, these gains have not been enough to keep up with ever-inflating living costs. Rent, home prices, and college costs have all increased faster than incomes in the U.S.